I had the opportunity to present research on using engaging reading aloud to promote language and symbolic play at the Council for Exceptional Children’s Early Childhood Conference this October. It was a wonderful opportunity to connect with other educators and hear about the current research in the field, particularly in the area of storybook reading. While talking to participants during our poster presentation, I realized how many teachers and therapists are looking for ideas on how to adapt books to use with students with unique needs. 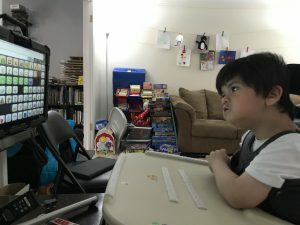 I am taking a step back here in this blog to talk about the whys and hows of adapting books to create engaging read aloud experiences for children like Joey who are using Augmentative and Alternative Communication. If we are going to spend time adapting and reading a book with our kids, we first need to make sure we are choosing quality, engaging books that meet the needs of our learners. Choose Engaging Books. Consider the child’s interests as well as the child’s developmental and language level. Choose books with an appropriate language level for the child. 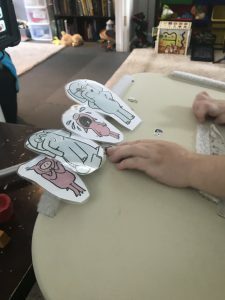 While a child may love books with things that go, he may not be engaged by Go Dogs Go, which can be lengthy, or a book like Otis, which has many words on each page. 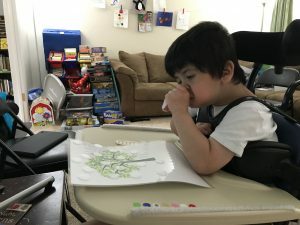 If a child loves the pictures of a particular book, but loses interest as you read the words, keep in mind that you do not have to read the words on the page. 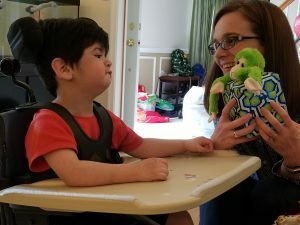 Engage through labeling the pictures, putting the story into your own words, or creating playful exchanges based on the pictures. If a character is eating ice cream you can pretend to eat ice cream too. Find books with repetitive phrases. 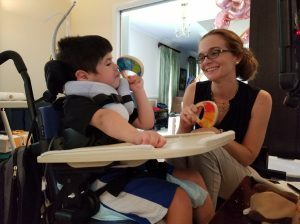 Repetitive phrases allow the child to participate in the reading, either orally, using an AAC device, or by shaking a musical instrument as you read the phrase. Look for books with the child’s core words. 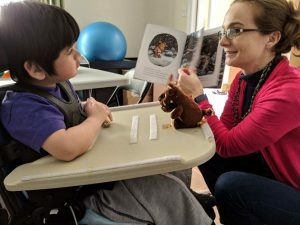 Read aloud give you a wonderful opportunity to model using the AAC device to communicate with core words, whether the words are in the book (“The bear wants more”) or can be supported in talking about the story. You can use the core words to talk about what is going on in the story. 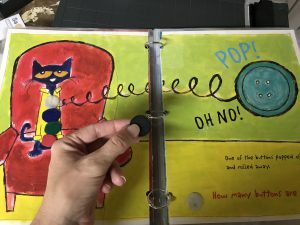 In Pete the Cat: I Love My White Shoes, it is easy to model the core words of Stop and GO, by adding the lines “Stop Pete!” And “Go Pete” to the story as he walks through piles of fruit and mud. Provide Choice: Students may surprise us with which books they find engaging, and which they do not. While I like to think I can predict what books Joey will like, he often surprises me. 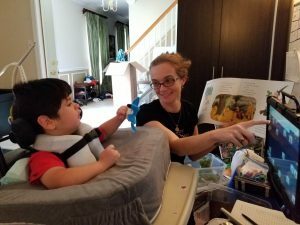 Giving Joey an option of what books to read allows him to have a choice in the read aloud experience, and promotes his engagement.